On a day where everyone was fighting their cars tooth-and-nail around the fast Atlanta Motor Speedway, it was fitness guru #99-Carl Edwards who wound up winning his seventh Sprint Cup race of the year, his third at Atlanta. After early worries about the pitch of his engine changing, his car never lacked for speed and remained with polesitter #48-Johnson through the early laps, taking the lead for the first time on lap 21. He lost a couple spots when the #48 blocked him in his pit stall during the first round of pit stops. After #48-Johnson’s struggles following a pit road speeding penalty, Edwards exchanged the lead with teammate #17-Kenseth when his crew had a slow stop under the third caution on lap 110. Soon, he was back to 2nd behind #11-Hamlin. 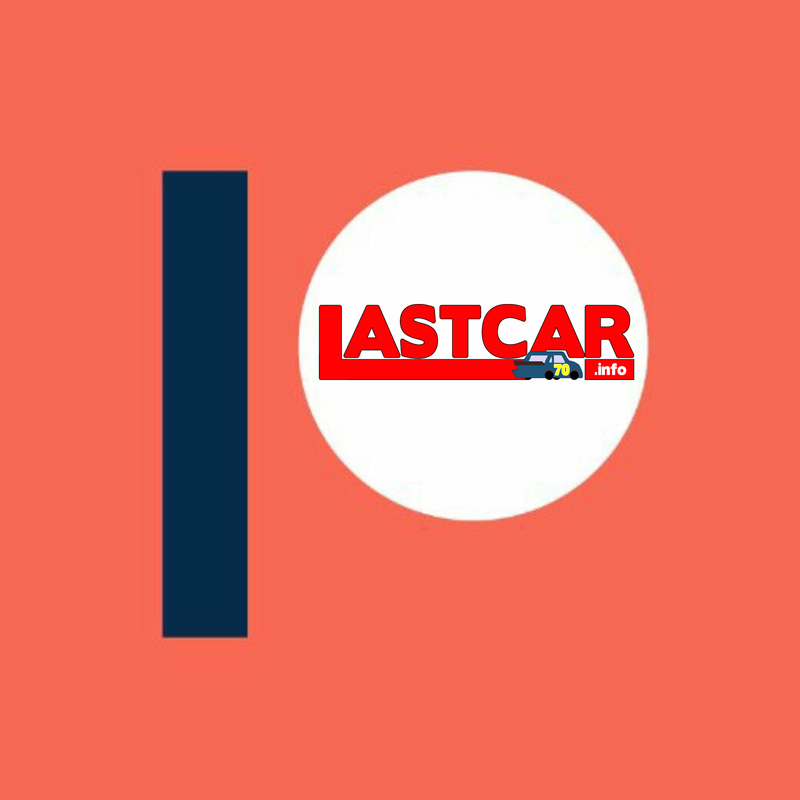 #11-Hamlin had problems with spinning his tires on restarts, and Edwards took advantage on the next-to-last restart with 16 to go to bump past #11-Hamlin for the win. Anticipations of a big points day went south, however, as #48-Johnson managed to rally with a late 4-tire stop to finish 2nd. As with his first Sprint Cup victory, which came at the track, Edwards also won the Nationwide Series race for that weekend, this time in Memphis. Led 98 laps. 2) #48-Jimmie Johnson** Won yet another rained-out pole position, but was mid-pack during all the subsequent practice sessions. At the green flag, he spun his tires to the point that he wobbled toward outside-polesitter #16-Biffle, ultimately leading to #99-Edwards taking the 2nd spot. He was first passed by #99-Edwards on lap 21, regained the lead off pit road under the second caution on lap 35, then dropped precipitously through the field. On lap 75, he nearly spun coming off turn two and called his car’s handling “evil.” As he pitted during the first round of green-flag stops on lap 90, he smoked his brakes coming down pit road so he could pit with leader #99-Edwards. The move resulted in him being caught speeding coming onto pit road, forcing him to serve a pass-through penalty on lap 91. He returned to the track in 30th. On the lap 115 restart following the third caution of the race (for debris), he quickly got by the slow-restarting cars of #9-Kahne and #12-Newman to get in position for the Lucky Dog. He was still in that position when #9-Kahne’s spin brought out the fourth caution on lap 130, giving him his lap back and restarting him in 20th. He was up to 13th with 95 laps to go. Under the tenth and final caution with 13 laps to go, crew chief Chad Knaus made the fateful decision to have him come in and change four tires along with a handful of other cars outside the top 10. After restarting 11th with 8 laps to go, he rocketed through the field, climbing to 7th with 7 to go, 4th with 4 to go, and past #11-Hamlin for 2nd off the final corner. The rally actually enabled him to gain points from a 149 point advantage over #16-Biffle to a 183 point margin over winner #99-Edwards. Led 28 laps. 3) #11-Denny Hamlin** Keeping pace with the leaders, he felt a vibration by lap 87 when he feared his tires were worn to the cords. Having moved up to 7th by lap 99, he silently, but deliberately, moved into contention for the lead. He was up to 4th by lap 203 and, under the fifth caution six laps later, he nearly collided with #99-Edwards as the two raced for 3rd off pit road. He won the battle and restarted 3rd behind #2-Ku. Busch and #17-Kenseth on the lap 216 restart. As the #17 and #2 raced for the lead, he closed in and, with 95 to go, was within sight of the lead pair. He had just moved by #2-Ku. Busch for 2nd with 73 to go when the sixth caution of the race came for debris. Under the yellow, he was able to beat #17-Kenseth off pit road by a half-carlength to take the lead for the first time. However, it became clear that his car struggled on restarts. When the race restarted with 68 to go, he spun his tires and was only able to stay out front by opening up an advantage through turns one and two. The same thing happened following the eighth caution with 28 to go, his car staying out front as #99-Edwards got past #17-Kenseth for 2nd. On the restart after that with 16 to go, #99-Edwards used this weakness to his advantage, bumping him as the two exited the quad-oval (similar to #18-Ky. Busch’s winning pass at Chicagoland). The contact caused him to wobble to the inside, allowing #99-Edwards to make the winning pass on him up high in turns one and two. Unable to return the favor on the final restart with 8 to go, he was passed by the surging #48-Johnson off the final corner and wobbled again, barely avoiding a wreck with the points leader as he fell to 3rd. Led 56 laps. 4) #17-Matt Kenseth** Raced into contention by moving up to 2nd on lap 61, then took the lead for the first time under the third caution of the race on lap 110 by beating teammate #99-Edwards off pit road. He held the lead for much of the middle stages of the race, maintaining it through pit stops under the fourth caution with a 12-second stop. He lost the lead by a hair to #2-Ku. Busch during pit stops under the fifth caution on lap 209, then regained it after a side-by-side battle with the #2 on lap 224. With 80 to go and his lead over #2-Ku. Busch at 1.43 seconds, he still worried that he wouldn’t be able to win the race because his car was so loose. He never regained the lead after #11-Hamlin beat him off pit road under the sixth caution with 72 to go, but held fast to a top 5. Led a race-high 128 laps. 5) #18-Kyle Busch** Ran the car he brought to his first victory of 2008 in the spring Atlanta event. Racing towards the top 10 on lap 120, he nearly spun while avoiding the nearby car of #41-Sorenson. 6) #2-Kurt Busch After nearly colliding with #29-Harvick during pit stops under the second caution of the race on lap 35, he raced into contention, moving up to 3rd by lap 99. Ironically, after slapping the outside wall off turn four with the right-rear of his car on lap 175, he seemed to get faster. Under the fifth caution on lap 209, he then took the lead for the first time by barely edging #17-Kenseth in the race off pit road. The move resulted in a tight side-by-side battle with #17-Kenseth that lasted from laps 222-224, his car holding the high line before the #17 took the lead. Led 12 laps. 7) #26-Jamie McMurray On lap 42, he was nearly pinched into the outside wall in the quad-oval while racing on the outside of #07-Bowyer and #83-Vickers in a three-wide battle. By lap 122, he had marched his way up to the 11th spot, and he was 9th with 87 laps to go. With 4 to go, he and #6-Ragan split #24-J. Gordon in the quad-oval as they raced into the 7th and 8th spots. Finally secured another good finish after his misfortune at Martinsville. 8) #6-David Ragan Flirted with the top 10 through much of the race and, after missing his pit stall under green on lap 188, was efficient in making up the lost ground. Though he lost a lap due to the extra stop, he got it back as the Lucky Dog under the sixth caution for debris with 72 to go. With 4 to go, he and #26-McMurray split #24-J. Gordon in the quad-oval as they raced into the 7th and 8th spots. 9) #24-Jeff Gordon** He was forced to make several changes to his car through the race, but was fortunately able to remain in the top 5 for just about the entire day. He did not, however, contend for the lead. 10) #16-Greg Biffle** Was irritated at the start of the race after #48-Johnson spun his tires and wobbled up towards him, causing him to check-up and lose 2nd to #99-Edwards. As early as lap 13, he worried about his car’s handling going away, and he fell from 2nd almost as soon as he retook the spot. On lap 158, he was stuck in 15th, his car still extremely loose. He went a lap down to leader #17-Kenseth on lap 208, then immediately got it back the next lap as the Lucky Dog when #55-Waltrip’s second blown tire brought out the fifth caution of the race. Fought his way into the top 10 during the final 8-lap dash to the checkers. Led 1 lap. 11) #88-Dale Earnhardt, Jr.** Once again, he had the fastest car on the track in the early laps and, again, this was credit to his running extremely close to the outside wall. After starting 9th, he was up to 4th just 29 laps into the race, at which point his was the fastest car on the track. He lost some spots on pit road under the second caution on lap 35 while waiting for #22-Blaney to get out of his way. His car’s handling suffered thereafter, and he required adjustments during the green-flag stops on lap 90 as his car was “dancing” on the right-rear tire. During the fourth caution of the race on lap 130, his crew was unsuccessful in removing his windshield tear-off, and it remained bunched-up on his windshield. Fortunately, it blew off the front of his car in turn one on the lap 136 restart. Unfortunately, his car was still extremely loose. As has typically happened with him in 2008, he scraped the outside wall, this time coming off turn two on lap 195. Exasperated, his crew chief said during the fifth caution on lap 209 that he was “running out of adjustments” to make his car tighter. After restarting 14th, he fought to get into the top 10, racing past #1-Truex, Jr. for 10th with 87 laps to go, then to 9th by 75 to go. Under the seventh caution of the race with 37 to go, his car bounced between #2-Ku. Busch and #99-Edwards coming off pit road, but none of the cars suffered any damage. Led 1 lap. 13) #29-Kevin Harvick** Once again ran his “go-to” car that gave him several top 10s through the summer and early fall, though it fell just short of picking him up another. His adventure began under the second caution of the race when he was forced to go into the grass coming off pit road to avoid #2-Ku. Busch. In the run that followed, his car pushed terribly and he was stuck mid-pack with teammates #07-Bowyer and #31-J. Burton. After some adjustments, he was back up to 9th on lap 127. 14) #10-A.J. Allmendinger Suffered some cosmetic damage to the nose of his car in the first caution of the race on lap 3 when he bumped the sliding #77-Hornish, Jr. into a spin after the #77 had spun #21-Elliott. He lost a lap, then got it back as the Lucky Dog when the multi-car wreck sparked by #22-Blaney brought out the ninth caution of the race with 22 to go. In the closing laps, he moved up further and picked up his second-straight top-15 finish in as many races driving for Ray Evernham. 15) #1-Martin Truex, Jr. Started 16th, then inched his way toward the top 10, where he sat for much of the middle-to-late stages of the race. After restarting 7th on the final restart with 8 to go, however, he dropped rapidly back to outside the top 10 as #48-Johnson and others with fresher tires raced past. 16) #12-Ryan Newman On Saturday, he picked up his first career NASCAR Craftsman Truck Series victory in his first-ever Truck Series start. He lost a lap sometime in the first part of the race, then got it back as the Lucky Dog when debris from #55-Waltrip brought out the eighth caution of the race with 28 laps to go. 17) #20-Tony Stewart** Lost a lap after running in the top 10 in the middle stages of the race, then got the Lucky Dog under the tenth and final caution (for debris) with 13 laps to go. 18) #31-Jeff Burton** Ran the same car he took the victory lane in the fall Charlotte race a few weeks prior. He struggled on the start, however, when he spun his tires badly and dropped from the 3rd starting spot. He then languished back around the 17th spot and was momentarily joined by teammates #29-Harvick and #07-Bowyer. Running 16th, opn lap 158, he was complaining the front end of his car wouldn’t turn. He was lapped by leader #17-Kenseth on lap 195. Under the sixth caution of the race with 72 to go, he sustained some damage to the left-front of his car when he made contact with the stopped #96-Schrader as he left pit road. The contact resulted in his left-front fender smoking heavily for a few laps after the restart with 68 to go, after which the tire rub repaired itself. He remained in the Lucky Dog spot and, as such, got his lap back when #55-Waltrip’s spin brought out the seventh caution with 37 to go. Was involved in the ninth caution of the race with 22 to go when he bumped the slowing #22-Blaney into a spin entering turn three, then moved high only to be trapped behind the wrecking #22 along with #41-Sorenson and #42-Montoya to his outside. As the wreck ensued, the damaged #41 slid into his right-rear, turning his slowing car into the outside wall, damaging the nose of his car. Quick work by his pit crew under the caution kept him in the top 20, but he was certainly out of competition. 19) #7-Robby Gordon Moved back off the bubble into 34th in owner’s points as #84-Speed finished 34th, moving the #84 team back to 35th in owner’s points. 20) #07-Clint Bowyer** His streak of three-straight 6th place finishes at Atlanta came to an end with a frustrating run. After starting 5th, he had fallen all the way back to 23rd on lap 68 as the air pressure adjustments made by his crew proved unhelpful. On lap 122, he was one lap down in 21st, a few spots behind teammate #31-J. Burton. Still back in the pack when the eighth caution fell with 28 to go, he suffered damage to the driver’s side of his car when he sideswiped #42-Montoya on pit road. The repairs required an extra pit stop under the yellow. 21) #83-Brian Vickers Was given a one-lap penalty under the eighth caution of the race with 28 to go for pitting outside the box, keeping him from securing a needed top-20 finish. 22) #8-Mark Martin Surprisingly, despite his history at Atlanta, he was 2 laps down on lap 182. 24) #77-Sam Hornish, Jr. (R) The top-finishing rookie for the series-leading eleventh time in 2008 ahead of #01-Smith with nine, #10-Carpentier with seven, and #00-McDowell with six. Brought out the first caution of the race on lap 3 when he slid into the left-rear corner of #21-Elliott coming off turn two and was then bumped by #10-Allmendinger, sending both he and the #21 spinning toward the inside wall. He avoided further contact and kept going as #21-Elliott stalled. He and #21-Elliott were then both penalized a lap for a pit road infraction under the caution. 25) #19-Elliott Sadler Caused the second caution of the race when he bumped #66-Riggs going into turn three, turning the #66 into the outside wall. 26) #43-Bobby Labonte Scraped up the right side of his car in an encounter with the wall sometime before his first green-flag stop on lap 85. 27) #38-David Gilliland Went down a lap, then got it back as the Lucky Dog when debris was spotted on lap 110. 29) #47-Marcos Ambrose (R) Made his first race in a Toyota as he took over the owner’s points for Michael Waltrip Racing’s #00 team for the remainder of the 2008 season. 33) #9-Kasey Kahne His car was perhaps handling the worst of anyone else. By lap 105, he was off the pace in the upper groove, forcing him to pit under green for new tires and adjustments on lap 108. He was trapped a lap down when debris was spotted on lap 110, bringing out the third caution of the race. On the ensuing restart, he narrowly averted a penalty for a false start when a logjam formed amongst the other lapped cars. He lost more laps when he brought out the fourth caution on lap 130, his car finally spinning off turn four by itself and not hitting anything. 34) #84-Scott Speed (R) His team fell to 35th in owner’s points as #7-R. Gordon finished 19th. Led 1 lap. 37) #55-Michael Waltrip Became the first man since Richard Petty to make 1,000 starts in NASCAR’s top three divisions when the command to start engines was given. For the first part of the race, he looked like he was going to celebrate his landmark start with a solid finish. After starting 29th, he was up to 16th on lap 29 and, despite brushing the wall off turn two around lap 45, was up to 12th on lap 77. He fell back to the last car on the lead lap under the fourth caution on lap 130 as he had a short in his helmet’s radio. The repairs took two separate stops to replace both his helmet and radio system. On lap 142, he got very loose off turn 2, but managed to save it. He was not so fortunate on lap 168 when he cut a right-rear tire, brushed the wall, missed the pit entrance, and pitted under green, costing him two laps. Another right-rear tire went down on lap 209, this time bringing out the fifth caution of the race when the tire exploded the right-rear quarter-panel off his Toyota in turn three. 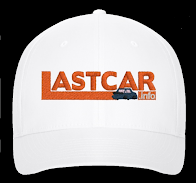 The lengthy repairs required a large grey patch over the gaping hole in the rear of his car. He then brought out the seventh caution with 37 to go when he spun out of the lower groove in turn two. He also brought out the eighth caution with 28 to go when the quarter-panel patch on his car came loose. 38) #21-Bill Elliott Was involved in the first caution of the race on lap 3 when #77-Hornish, Jr. merged into the left-rear corner of his car coming off turn two, sending him spinning into the inside wall on the backstretch. The driver’s side of his car bounced off the inside wall before the car stopped on the apron with all its tires flat. He re-entered the race several laps down, losing an additional lap with #77-Hornish, Jr. for a pit road violation under that first caution. 39) #41-Reed Sorenson Was damaged in the ninth caution of the race with 22 to go when, while running high in turn three, his path was blocked by the wrecking #22-Blaney in front of him and #31-J. Burton to his left. Teammate #42-Montoya, also with nowhere to go, slammed into the rear of his damaged car. The contact turned him to the left, clipping #31-J. Burton in the right-rear and turning the #31 into the outside wall. 40) #42-Juan Pablo Montoya Returning to the scene of his first oval-track top 5, he climbed up from the 24th starting spot to 14th on lap 77, 10th by lap 99, 7th by lap 203, and all the way up to 5th with 37 to go. Like #2-Ku. Busch, he had sustained some scrapes to the right-rear of his car after clipping the wall, but his car continued to drive well in spite of the contact. Unfortunately, his great run ended with some terrible luck in the final stages. Under the eighth caution with 28 laps to go, he and a few other cars behind the leaders decided to pit for fresh tires. While leaving his stall, his car was sideswiped by the passing car of #07-Bowyer, nearly ripping the front clip off his Dodge. The repairs required an extra stop that mired him back in traffic for the final scramble to the finish. This, unfortunately, put him in the middle of the ninth caution of the race with 22 to go. Committed to the outside line, he had nowhere to go when #41-Sorenson collided with #31-J. Burton and #22-Blaney. Lost in the smoke, he rear-ended the #41, severely crumpling his already-damaged nose. 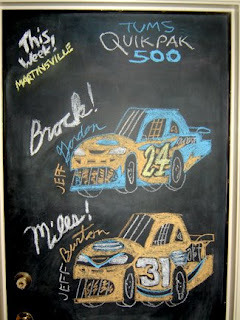 41) #22-Dave Blaney The race was his 300th Sprint Cup start. Unfortunately, the race did not go well for him as he ended up sparking the ninth caution of the race with 22 to go. Entering turn three on that lap, he slowed down to get out of a three-wide battle and wound up getting bumped in the left-rear by #31-J. Burton. His car spun up the track and backed into the wall, trapping #31-J. Burton along with #41-Sorenson and #42-Montoya in the high lane. 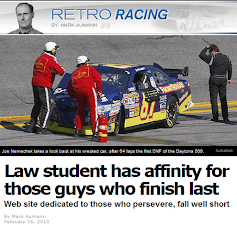 As his wrecked car slid down the track, #78-Nemechek then hit the rear of his car with the #78's right-front. The wreck was costly as, though still 33rd in owner’s points, it dropped him from 121 points to just 80 ahead of 35th place #84-Speed. 42) #78-Joe Nemechek Lost a lap early, then received the Lucky Dog when #66-Riggs’ crash brought out the second caution of the race on lap 35. He was not so lucky when he was the last car involved in the ninth caution of the race with 22 to go. He was driving near the apron when #22-Blaney’s wrecked car stopped in his path and, with nowhere to go, he ran into the rear of the #22, damaging his right-front fender. 43) #66-Scott Riggs Was severely damaged in the second caution of the race on lap 35 when #19-E. Sadler bumped him going into turn three, turning him into the outside wall. His car suffered damage to the right-front corner along with some scraping along the passenger side. Still finished running, though 128 laps down to winner #99-Edwards. Unfortunately, the finish dropped him back to 32nd in owner’s points, 102 markers ahead of 35th place #84-Speed. Point leader #48-Jimmie Johnson had a dream weekend at one of his best tracks, claiming his most dominant victory in terms of number of laps led. After being awarded the pole when qualifying was rained-out for the ninth time in 2008 and being the fastest car in Saturday’s first practice session, Johnson was in a league of their own. Fast pit stops from the best pit stall on the congested pit road and a well-handling car invariably resulted in his car leading. Johnson did, however, have his share of close calls: he avoided the slowing car of #12-Newman on lap 333, made contact with #21-Elliott that creased his right-front fender on lap 346, one of his crewmen was nearly run over by #99-Edwards under the ninth caution on lap 381, he had to dodge the slowing #00-Bliss on the backstretch with 49 to go, then had to survive a green-white-checkered finish against teammate #88-Earnhardt, Jr.. Still, Johnson overcame it all and cruised to an easy victory over #88-Earnhardt, Jr. The race marked the sixth straight time Johnson has led more than 100 laps at Martinsville. Johnson expanded his point lead to 149 over #16-Biffle. Led a race-high 339 laps. 2) #88-Dale Earnhardt, Jr.** After running with the leaders due to his ranking in the Chase for the Championship, he was dropped back to 41st under the first caution on lap 28 for speeding on pit road. Frustrated, he marched back through the pack, nudging #70-Raines out of his way off turn two on lap 40. He was back to 29th when the second caution fell on lap 61, and when he stayed out under that yellow, he restarted in 5th. Still, he kept the aggression on and brought out the third caution on lap 82 when he spun #26-McMurray out of 3rd off turn four. From there, he seemed to settle down, rolling through the corners and saving his brakes for the final part of the race. This cautious strategy enabled him to battle #99-Edwards for the 2nd spot in the final laps, claiming it with 87 to go. From there, he inched towards #48-Johnson, getting as close as 0.4 seconds behind with 45 to go after the #48 had to avoid hitting the slowing #00-Bliss. He lost 2nd to #99-Edwards off pit road under the tenth caution which fell with 43 to go, then got it back under green with 29 laps remaining. In the final green-white-checkered finish, he didn’t get as good a start as #48-Johnson and slipped off the corners, but still held off #99-Edwards to finish 2nd. 3) #99-Carl Edwards** Though his car’s splitter was hitting the track hard during the race, his car became very competitive once the tire pressures came up, moving up to 3rd by the second caution on lap 61. He held that spot for much of the race whenever #48-Johnson retook the lead. Closing in on the leaders past the halfway mark, he climbed as high as 2nd on lap 328. Under the ninth caution of the race on lap 381, he almost ran over a member of #48-Johnson’s pit crew as the two raced off pit road from the first two stalls. 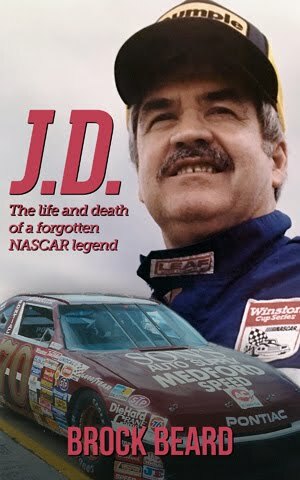 Having failed to beat #48-Johnson out of the pits on that final stop, he found himself racing #88-Earnhardt, Jr. for the rest of the race. Apparently, he forgot to communicate an adjustment to his crew chief during the tenth caution with 43 to go and though he restarted 2nd, he lost the spot to #88-Earnhardt, Jr. with 29 to go. He almost hit #17-Kenseth in front of him while checking up for the slowing #00-Bliss with 26 to go. With 7 to go, he tried to race under #88-Earnhardt, Jr. for 2nd, but couldn’t quite do it. 4) #24-Jeff Gordon** Had the fastest car in Happy Hour and hoped to make up for the rained-out qualifying session that prevented him from picking up another Martinsville pole. After starting 8th, he made up the lost ground quickly by moving to 3rd on lap 11, 2nd on lap 19, and the lead past #48-Johnson on lap 36. That pass came right after a daring cut beneath #48-Johnson on the lap 35 restart following the first caution of the race. He held the top spot until #48-Johnson retook it on lap 56. After hounding the rear bumper of the #48 on lap 190, he retook the lead on lap 241, lost it off pit road under the eighth caution on lap 256, then regained it on lap 272 before losing it once more to the #48 on lap 293. From that point on, he hovered between 5th and 10th. He got back up to 4th with 55 to go, but could do little more than race #83-Vickers and, later, #11-Hamlin, to defend the spot after that. By taking two tires and leaving early, his car was the one in the way of #31-J. Burton during final pit stops under the tenth caution brought out by #41-Sorenson with 43 to go. The move also, however, kept him in the top 5. Led 57 laps. 5) #11-Denny Hamlin** He and a handful of other drivers from 18th position on back pitted under the first caution on lap 28, and his car managed to gain the most spots by the second caution on lap 61. At that point, he had marched back up to 11th. After the fifth caution on lap 114, he fought #48-Johnson in traffic, splitting #70-Raines as the two raced side-by-side before the two shoved each other up the track in the turns. He was running 6th on lap 328. Did not bring the same car he drove to victory in the spring race. 6) #5-Casey Mears Had another excellent run for the second-straight Martinsville race. He moved into contention by following #8-Almirola’s strategy to restart 4th on lap 68, then was in 10th on lap 331 and 6th with 16 to go. 7) #29-Kevin Harvick** Though he came up short of his expectations to run in the top 5, he still had a solid run. He hovered just outside the top 10 for much of the race with Childress teammates #31-J. Burton and #07-Bowyer. Under the eighth caution on lap 256, he lost some spots on pit road when his crew accidentally unhooked his sway bar, then bumped the right-front fender of #31-J. Burton while leaving the congested pit road. 8) #17-Matt Kenseth** Brought out the fifth caution of the race on lap 114 when he suddenly wobbled into #78-Nemechek entering turn three, sending the #78 backing into the outside wall. He cut a tire in the incident and suffered damage to the rear of his car which his crew mended with tape. He lost a lap, then got it back as the Lucky Dog when #19-E. Sadler’s crash brought out the seventh caution on lap 196. Languishing in the middle of the field, he took a chance by not pitting with the rest of the leaders with 43 to go and wound up the leader when the race was restarted with 34 to go. Not only did he lead a few laps before #48-Johnson retook the top spot, but he picked up a top-10 that seemed unlikely several laps earlier. He was forced to check-up on the frontstretch with 26 to go when #00-Bliss slowed in front of him, causing #99-Edwards to slow down as well. He pitted along with #83-Vickers and #07-Bowyer under the eleventh caution with 15 to go and got a few spots back in the final laps. Teammate #6-Ragan crossed his nose off turn four and he couldn’t avoid bumping the #6, ultimately leading to #6-Ragan spinning in the twelfth and final caution of the race. Led 8 laps. 9) #1-Martin Truex, Jr. Was certainly justified in saying he had the best car he’s ever had at Martinsville by remaining at the tail end of the top 10 for much of the afternoon. After starting 18th, he was 8th on lap 161. He valiantly defended his top 10 run, hanging onto the 9th spot even after getting loose into turn three and running close to the wall on lap 304. He was even more steadfast against #31-J. Burton, who was determined to knock him out of 10th. Between 84 and about 68 laps to go, the #31 was all over his rear bumper, and with 68 to go, he nearly spun when the #31 clipped the right-rear corner of his car coming off turn four. 10) #07-Clint Bowyer** Ran as high as 2nd to #26-McMurray after the fifth caution on lap 114 before his car got tight, causing him to slowly slip back in the pack to Childress teammates #29-Harvick and #31-J. Burton. The car he drove was the same one he took to both his Sprint Cup victories at New Hampshire in 2007 and Richmond in May. He pitted along with #17-Kenseth and #83-Vickers under the eleventh caution with 15 to go and got a few spots back in the final laps. He avoided being spun by the loose #6-Ragan with 3 to go when the #6 got out of control and spun between turns one and two. 11) #83-Brian Vickers Authored one of the most surprising runs of the day when, after matching the strategy of #8-Almirola and #44-Reutimann under the sixth caution on lap 162, he managed to not only stay in the top 10, but inch into the top 5. During the long green-flag run that followed the eighth caution on lap 256, he moved up to 7th by lap 328, 4th on lap 373, and 3rd just before the eighth caution fell on lap 381. He pitted along with #17-Kenseth and #07-Bowyer under the eleventh caution with 15 to go and got a few spots back in the final laps. Unfortunately, the car was found to be in violation of some rules in post-race inspection, resulting in a loss of 150 driver and owner points as well as the indefinite suspension of both his crew chief and car chief. 12) #16-Greg Biffle** Crossed the nose of #00-Bliss on lap 47, but saved his car from spinning. Trying to stay with the leaders, he took two tires under the second caution on lap 61 to come off pit road in 3rd. When that strategy resulted in him falling back in the pack, he tried another strategy by staying out during the sixth caution on lap 162. He held the lead briefly after the lap 170 restart before losing it to #48-Johnson on lap 174. He smoked his left-front tire around lap 177 as he continued to slip back in the pack. He hoped the strategy would pay off with a timely caution, but it didn’t come in time and he was forced to pit out of 8th on lap 245. He was then trapped down a lap when the eighth caution fell for #43-B. Labonte’s spin just 11 laps later. Determined to get the Lucky Dog, he went three-wide past #88-Earnhardt, Jr. and the first lapped car, #8-Almirola, anticipating another caution. Again, the yellow took too long to happen and he lost the Lucky Dog to #10-Allmendinger when the yellow finally fell on lap 381. On a restart with 34 to go, he raced past teammate #17-Kenseth to get his lap back, lost it again when #48-Johnson passed them both to reassume the lead, then got his lap back once more as the Lucky Dog when #38-Gilliland’s wreck brought out the eleventh caution with 15 to go. Moved up to 2nd in points, 149 behind leader #48-Johnson. Led 9 laps. 13) #6-David Ragan Though he was forced to a backup car after wrecking in the first practice session and spraying oil through the garage area, he was still confident he would have a good run on Sunday. He immediately climbed through the pack and was up to 18th on lap 186, 11th on lap 331, and 9th on lap 373. He was still in the top 10 with 3 laps to go when he crossed the nose of #17-Kenseth off turn four and was bumped by the #17, sending him wobbling to the bottom of the track. The wobble messed up his entry into turn one, causing him to clip #07-Bowyer and spin, bringing out the twelfth and final caution of the race which set up the green-white-checkered finish. 14) #42-Juan Pablo Montoya Was at the center of the first caution of the race on lap 28 when he bumped #44-Reutimann into #28-Kvapil going into turn one, sending the #28 into the outside wall. His crew advised him through the race to take care of his brakes as he had struggled with brake problems through much of the spring Martinsville event. The brake problems surfaced when he was running a respectable 15th on lap 213, but began struggling with his handling. 15) #10-A.J. Allmendinger Seemed to be very comfortable in his Gillett-Evernham Racing debut when he was fast in practice. While fighting to stay on the lead lap, he got into a skirmish with #43-B. Labonte off turn two on lap 256 and brought out the caution when he nosed under the #43 and cut his left-rear tire, sending him spinning up the track. On lap 373, his was the last car on the lead lap in 16th, and he was lapped just before the ninth caution fell for #2-Ku. Busch’s slowing car, giving him the Lucky Dog. 16) #21-Bill Elliott Picked up his best run of the season with his first top-20 finish since the August race at Pocono. He lost a lap in the first green-flag run, but got it back as the Lucky Dog when #28-Kvapil’s spin brought out the first caution on lap 28. By lap 203, he was running a solid 20th despite damage to the nose and rear bumper of his car in an undisclosed incident. 17) #31-Jeff Burton Though he started 2nd due to his points position and was expected to contend, his car was much too loose to be competitive. By lap 47, he had already slipped back to 7th. He hovered around 15th after that and was bumped in the right-front by teammate #29-Harvick on pit road under the eighth caution on lap 256. He also nearly spun on lap 283 when he wheel-hopped going into turn one. Somehow, his car got better in the final 150 laps, and he raced #1-Truex, Jr. so hard for 10th with 68 to go that he clipped the rear bumper of #1 coming off turn four. When #41-Sorenson’s crash brought out the tenth caution of the race with 43 to go, he lost this advantage due to a pit miscue. #24-J. Gordon’s car, which took only two tires, blocked his entry as the #24 left, forcing him to pit at an angle that crossed the front line of his stall. His crew began work before realizing he was over the line and only did a two-tire stop. He was forced to return to the pits both to complete the stop and serve the penalty, forcing him to rush to make up some spots in the final laps. Fell to 3rd in points, 152 behind #48-Johnson and 3 behind 2nd place #16-Biffle. 18) #55-Michael Waltrip Had a close call under the first caution of the race on lap 28 when #22-Blaney locked up his brakes in front of him and nearly spun into his path coming off turn two. 19) #28-Travis Kvapil Brought out the first caution of the race on lap 28 when, while entering turn one, #42-Montoya bumped #44-Reutimann into him, sending his car backing into the outside wall. The damage, however, was minor and he got back a lap he lost when #26-McMurray’s spin brought out the third caution on lap 82. He climbed back into the top 20 by running 19th on lap 230 and wound up finishing there. 20) #8-Aric Almirola Took the lead by staying out under the second caution of the race on lap 61 and managed to hold it, at times by nearly a second, through the fifth caution on lap 114. Under that caution, his crew struggled with changing his right-rear tire, dropping him back to 7th of the cars that pitted while others stayed out. Though he remained in the top 10 by matching the strategy of #44-Reutimann and #83-Vickers under the sixth caution on lap 162, he was soon mired in the pack. There, he suffered damage to the front of his car in the seventh caution on lap 196 when he turned #19-E. Sadler into the outside wall. Repairs cost him a lap and, after restarting 32nd, he sustained some minor damage sideswiping the slowing #44-Reutimann on lap 299. He was just able to re-enter the top 20 at the finish. Led 53 laps. 21) #66-Scott Riggs Led 1 lap. 22) #22-Dave Blaney Locked up his brakes during the first caution on lap 28 and nearly spun when he saw #28-Kvapil wreck, but kept going. Later, on lap 362, he nearly hit the slowing #20-Stewart on the backstretch when the #20 cut the first of two right-front tires. 23) #12-Ryan Newman Ran as high as 2nd when he stayed out behind #8-Almirola under the second caution on lap 61 brought out by #9-Kahne. He was running around mid-pack when he was caught speeding off pit road under the eighth caution of the race on lap 256, sending him to the tail end of the longest line. Still stuck in traffic on lap 333, he blew a right-front tire in turn three and slowed right in front of #48-Johnson, who nearly ran him over. 24) #44-David Reutimann After sustaining some cosmetic damage in the first caution of the race on lap 28 when #42-Montoya bumped him into #28-Kvapil, he used pit strategy to get into the top 10 along with #44-Reutimann and #8-Almirola under the sixth caution on lap 162. The strategy seemed to work as he was still running 12th on lap 280. However, on lap 299, his car suddenly went up the track in turn two due to a cut right-front tire. Forced to pit under green, he was sideswiped by #8-Almirola as he moved low on the backstretch. Later, he brought out the eleventh caution with 15 to go when he cut the left-rear tire of #38-Gilliland with his splitter, sending the #38 into the outside wall. 25) #45-Chad McCumbee (R) Lost a lap, then got it back as the Lucky Dog when #18-Ky. Busch, #70-Sauter, and #77-Hornish, Jr.’s simultaneous flat tires on lap 162 brought out the sixth caution of the race. 26) #20-Tony Stewart** His frustrating afternoon began with his splitter dragging so much on the track that smoke billowed from behind his car. His was one of the few cars who ever beat #48-Johnson off pit road, accomplishing this by taking two tires under the fifth caution brought out by #17-Kenseth on lap 114. On lap 331, he was running 8th, but was struggling with brake problems. However, on lap 362, he was forced to pit under green with a flat right-front tire, his car nearly hit by #22-Blaney in the process. He cut a second tire with 47 laps to go, forcing another costly stop. 27) #15-Paul Menard Cut a right-front tire on lap 255 along with #70-Raines and both pitted when the eighth caution fell for #43-B. Labonte’s spin the following lap. 28) #96-Ken Schrader Suffered the same splitter problem as #20-Stewart in the first part of the race when his car wobbled up the track in turn four just a few laps into the event. He did manage to use pit strategy to run as high as 5th on the lap 121 restart following the fifth caution of the race. 29) #18-Kyle Busch** He complained on lap 99 that he was getting beaten into and off of the corners due to a braking issue and the day did not get much better from there. On lap 162, he brought out the sixth caution of the race when he cut a right-front tire and stopped at the exit of turn two. #70-Raines and #77-Hornish, Jr. also cut right-front tires in that turn a few seconds later in separate incidents. He was then penalized two laps for intentionally stopping to bring out the caution. He cut another tire under green on lap 349 and a third with 62 to go, dropping him further back in the final stages. 30) #84-Scott Speed (R) Made his Sprint Cup debut in the aftermath of his electrifying performance in the ARCA finale at Toledo. The run, while quiet, moved the #84 team up to 34th in owner’s points, 15 ahead of #7-R. Gordon. 31) #70-Tony Raines Was nudged out of the way by the resurgent #88-Earnhardt, Jr. coming off turn two on lap 40, but saved his car from spinning. His car was also in an unwanted three-wide situation on lap 124 when #48-Johnson and #11-Hamlin passed him high and low at the same time going down the backstretch. He, along with #18-Ky. Busch and #77-Hornish, Jr., cut a right-front tire in turn two on lap 162 as part of the strange sixth caution of the race. He cut another right-front tire in another synchronized incident with #15-Menard on lap 255, this time hitting the wall in turn two. He was on pit road with #15-Menard when the eighth caution fell for #43-B. Labonte’s spin on lap 256. 32) #38-David Gilliland Lost a lap, then got it back when #43-B. Labonte’s spin brought out the eighth caution of the race on lap 256. With 15 to go, he was racing #44-Reutimann into turn three when the #44 cut his left-rear tire, sending him backing hard into the outside wall. 33) #9-Kasey Kahne Brought out the second caution of the race on lap 61 when his car suddenly slowed off turn four and stopped in turn one. The repairs took his crew 15 laps to complete in the garage area before he returned to the track around the third caution on lap 82. 34) #77-Sam Hornish, Jr. (R) The top-finishing rookie for the series-leading tenth time in 2008 as #84-Speed and #45-McCumbee were not competitors for 2008 Rookie of the Year, breaking the tie with #01-Smith’s nine ahead of #10-Carpentier with seven and #00-McDowell with six. He, along with #18-Ky. Busch and #70-Raines, cut a right-front tire in turn two on lap 162 as part of the strange sixth caution of the race. He cut another right-front tire under green sometime before lap 349. 35) #41-Reed Sorenson Ran a solid race for much of the afternoon starting with a 10-spot gain under the second caution on lap 61 that moved him from 19th to 9th. With 43 to go, he was running 14th in position to get the Lucky Dog when he backed into the outside wall in turns three and four, ending his day. 36) #2-Kurt Busch Struggled mightily from the moment he went behind the wall to get a new right-rear brake caliper at the tail end of the second caution on lap 61. He returned to the track laps down to the field only to spin on the frontstretch on lap 104 without bringing out the caution. 24 laps down, he ironically raced #48-Johnson very hard to get one of those laps back on the lap 204 restart following the seventh caution of the race. He also cut a right-front tire on lap 320, avoided hitting the wall, and had to make another green-flag stop. He failed to miss the wall when he cut another right-front tire on lap 379 and when he missed the pit road entrance, he brought out the eighth caution two laps later. At that point, he was so angry that he asked to park the car for the day. His crew refused, at which point he implied he might hurt himself on the track. 37) #43-Bobby Labonte Was involved in the eighth caution of the race on lap 256 when he spun after #10-Allmendinger bumped into him coming off turn two, cutting his left-rear tire and sending him spinning up the track off the corner. A rear gear problem sent him to the garage area with 55 to go and he returned laps down to the field with 34 to go. 38) #26-Jamie McMurray Had an adventurous afternoon when he started 20th, used pit strategy to get on the same cycle as #8-Almirola to restart 3rd on lap 68, then was spun out by an aggressive #88-Earnhardt, Jr. coming off turn four on lap 82. He then took the lead by staying out under the fifth caution on lap 114 and held it until he let #48-Johnson by on lap 154. From that point, he remained in the top 10, often the top 5, for much of the race. With 103 laps to go, he was still running in 4th when he suddenly slowed on the backstretch and went behind the wall with a broken axle. He returned to the track several laps down with 65 to go. Led 37 laps. 39) #00-Mike Bliss Made his first Sprint Cup start since he drove for BAM Racing in 2007's spring race at Texas. He struggled from the beginning, however, as early as lap 17 when he slapped the backstretch wall with the right-rear corner of his car, causing a fender rub. He twice received the Lucky Dog when #01-Smith brought out the fourth caution on lap 89 and when #17-Kenseth brought out the fifth on lap 114, but was still four laps down both times. His car slowed suddenly on the backstretch with 49 to go right in front of leader #48-Johnson, who had to take evasive maneuvers. On the frontstretch with 26 to go, he slowed again, this time nearly collecting #17-Kenseth and #99-Edwards who were racing for 3rd. The team remains 36th in owner’s points, now 75 behind #7-R. Gordon. 40) #7-Robby Gordon Went behind the wall on lap 175 to get his rear gear replaced. The run, combined with #84-Speed’s 30th place debut, moved him back down to 35th in owner’s points, 15 behind the #84 and 75 ahead of #00-Bliss. 41) #19-Elliott Sadler Was taken out in the seventh caution of the race when, while running 19th entering turn one, he was clipped in the left-rear by #8-Almirola, sending his car spinning into the outside wall. He hit the outside wall flush with the driver’s side of the car, but was okay. 42) #01-Regan Smith (R) Brought out the fourth caution on lap 89 when, while running 12th, he suddenly lost brake fluid and backed into the turn two wall. The leaking fluid ignited behind his right-front tire, creating a small fire before he returned to pit road for extensive repairs. 43) #78-Joe Nemechek Was damaged in the fifth caution of the race on lap 114 when #17-Kenseth unexpectedly wobbled into him going into turn three, sending his car backing so hard into the outside wall that the rear decklid was jammed perpendicular to the track surface.